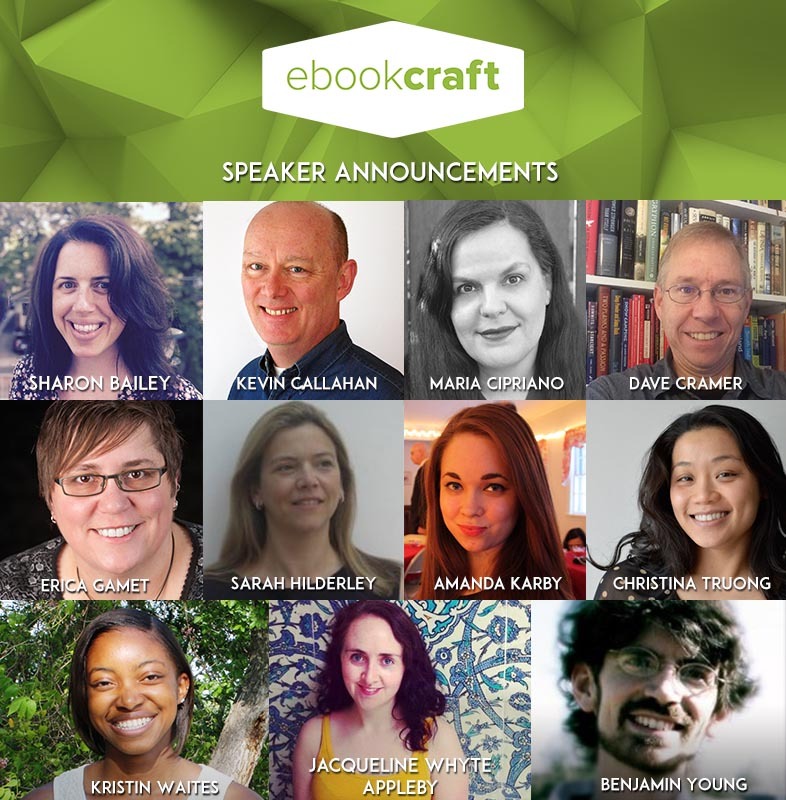 It’s time to announce the second round of our fantastic Tech Forum and ebookcraft speakers! We have quite a few intelligent, interesting speakers to present to you. You can also click on a session title to learn more about it. We announced a first round of speakers back in November, and have published a couple of guest blog posts from some of those speakers so you can get a taste of what they will be talking about in their sessions. For example, progressive enhancements and bionic bookselling. And now we’re sure you can feel the excitement building as we reveal this next round of speakers. We hope you have your ticket already or you’re about to experience some serious FOMO (fear of missing out)! Sharon Bailey is a librarian at the Centre for Addiction and Mental Health where her responsibilities include reference, research support, and instruction for CAMH staff, patients, caregivers, and the public. She has a particular interest in collaborating with fellow librarians and education specialists both within and outside of CAMH to embed library instruction into clinical practice and continuing medical education. Sharon is a graduate of the Master of Information program at the University of Toronto. Prior to joining the library profession, Sharon spent a number of years in the book publishing industry including stints at McClelland & Stewart and House of Anansi Press. Maria Cipriano is a Senior Collections Specialist at the Toronto Public Library and is responsible for adult digital collections including ebooks, digital magazines, and other streaming services. She has over 25 years of collection development experience in public libraries and is a keen advocate of digital collections. Maria is also actively involved in staff training and community outreach. Jacqueline Whyte Appleby is a librarian at Scholars Portal, where she works on license negotiation, loading, metadata distribution, and user accessibility for books and journals collectively purchased by Ontario Universities. At present, Scholars Portal locally hosts over 48 million journal articles and 600,000 books, with much of that content sitting in a Trustworthy Digital Repository. Before she decided to pursue librarianship, Jacqueline spent many years shelving and offering recommendations in the fiction and children’s departments at Indigo. She is the co-chair of the 2018 Ontario Library Association Super Conference, a long-time member of Choir!Choir!Choir!, and a new mother. Kristin Waites is the Digital Products Assistant at The MIT Press, where she coordinates the ebook production and distribution process and heads their diversity and accessibility initiatives. Her first foray into the ebook world was at Baylor University Press, where she worked as the Digital Publishing and Production Specialist. In her spare time, Kristin blogs about food, writing, and traveling at kristinwaites.com. Follow her on Twitter: @kristinwaites or connect on LinkedIn. Amanda M. Karby is a Digital Publishing Coordinator with Michigan Publishing Services, a division of Michigan Publishing in the University of Michigan Library. Prior to this she was with The MIT Press. Her current role is focused on digital journal production and project management. Serving as a member of Michigan Publishing’s Accessibility Task Force, she is working together with her colleagues to assess and improve the publisher’s accessible publishing standards. She holds an MA in publishing from Emerson College. Follow her on Twitter: @editorialism. Benjamin Young is a web, digital publishing, and open source advocate. Benjamin’s focus is on content and how human beings interface with it and each other around it. He currently explores the edges of a re-decentralized web using annotation, distributed identity, and offline-friendly web apps and extensions. Benjamin is currently a Solutions Architect at John Wiley & Sons where he works on the Web Annotation Working Group and Digital Publishing Interest Group at the W3C. Kevin Callahan is the owner of BNGO Books, a New York City–based print and digital design and production studio. His long experience with new and evolving technology — where big expectations meet real-world possibilities — gives him great perspective on creating ebooks of every variety. Kevin also teaches design and technology and writes on ebook matters for a variety of publications. He is part of the vibrant #eprdctn community, where knowledge and experience are generously shared. You can follow him @BNGObooks and visit his website at BNGObooks.com. Sarah Hilderley works as Community Engagements Manager for the International Digital Publishing Forum and advocates for accessibility via the use of EPUB and other digital standards. She maintains and authors the website epubzone.org, an IDPF news and community site for all things EPUB. She took the lead in The Enabling Technologies Framework — a global accessibility project funded by WIPO and delivered by EDItEUR, the international standards body. This three-year global project developed a worldwide standard of best practice for publishers helping them ensure full accessibility to their digital material for the print-disabled. Sarah has worked in publishing for many years, most notably as Production Director at HarperCollins Publishers, UK. Her work there included the creation of the standard ‘prelims,’ which looks at social responsibility and ethical sourcing of a publisher’s third-party suppliers. She currently owns the small Independent Press, Quarry Press, with her husband, Tristan Hilderley. Christina Truong has a decade of experience in the tech industry. She has worked with top digital agencies as well as headed up the front-end development for a software company. As an educator, she has taught over 1,000 students in various educational settings. In her former role as Director of Curriculum for a non-profit organization, she developed and managed all the adult coding programs and provided instructor training for all 20+ Canadian chapters. These days, she is working independently to offer technical consulting services. She also writes and speaks about code, technology, and diversity and teaches a full-body weight training class. Visit her website or follow her on Twitter: @christinatruong. Erica Gamet has been involved in the graphics industry for nearly 30 years. She is a speaker, writer, and trainer focusing on Adobe InDesign and Illustrator, Apple Keynote and iBooks Author, and other print- and production-related topics. She is the creative track chair for the iBooks Author Conference, a regular contributor to InDesign Magazine and CreativePro.com, and offers online training and tutorials on CreativeLive.com as well as through her own YouTube channel. After living as a nomad for almost a year, she recently put down roots in El Paso, Texas, where she hikes and bikes every chance she gets. Check out ericagamet.com to see all of Erica’s upcoming events, tips and tricks, and workbooks. Dave Cramer has been making ebooks for 15 years, and complaining about ebook standards for nearly as long. He was co-editor of the IDPF specification on fixed-layout ebooks, but in recent years has become heavily involved with the W3C and web standards, editing several specs for the CSS Working Group and writing “Requirements for Latin Text Layout and Pagination” for the Digital Publishing Interest Group. When not doing standards work, Dave writes XSL, works on typesetting with HTML+CSS, hunts for interesting information in mountains of XML files, and skis up and down literal mountains, preferably in Canada. He dreams of bringing the rich history of print design and typography to ebooks and the web. Follow him on Twitter: @dauwhe. Robert Wheaton is Chief Operating Officer at Penguin Random House Canada, where he has worked since 2011. His responsibilities include sales, marketing, consumer insights, customer operations, terms negotiations, and digital strategy. Flagship projects have included Hazlitt, an online magazine that has received eight National Magazine Award gold medals since its launch in 2012; and Penguin Shop which opened in summer 2016. A former web developer, Robert provided website solutions for cultural organizations and institutions (art galleries; museums; magazines) and consulted for educational institutions. From 2005–2011, Robert worked at Indigo Books & Music, including as Director of Inventory Management. Robert’s professional interests include digital content development, business strategy, organizational structure, and how businesses can derive the best results from teams — and provide the most engaging work environments — at times of complex structural change. Robert is also a published writer and brings an author’s perspective to his professional responsibilities. Cameron Drew is a near 14-year veteran in the online retail and tech start-up side of book publishing. Cameron spent six years observing online retail fulfillment while working with Ingram, five years in the dragon tail days of Kobo helping direct their international expansion, one year with the excellent Canadian crew at Shelfie, and most recently two years with Booktrack helping build out their catalog in ebooks and more recently with audiobooks. He’s very friendly. Come say hello. Ashleigh Gardner is Head of Partnerships for Wattpad Studios where she creates meaningful promotional and editorial partnerships with the publishing, advertising, and entertainment industries. She also helps manage the Wattpad Stars program, launched in 2015. The program helps Wattpad writers take their skills to the next level, and gives publishing and brand partners an opportunity to tap into an international roster of digital influencers with massive audiences on and off Wattpad. Before joining Wattpad, Ashleigh was director of content management at Kobo, where she focused on expanding Kobo’s existing catalogue, while developing new ebook stores in international markets. Prior to Kobo, she was manager of digital development at Dundurn Press. Noah Genner has an extensive background in independent bookselling, software and business development. As the leader of BookNet Canada he orchestrates a skilled team of technical, policy oriented and client focused staff to provide new data management services and supply-chain initiatives to the Canadian publishing and book retail sectors. Before working at BookNet Canada, Noah ran his own technology and software development consulting business, servicing a wide range of clients including book publishers and printers. Prior to that, Noah was Director of Software Development for consumer market research leader Compusense, where he oversaw the development of a variety of software projects used by numerous Fortune 500 companies worldwide. Noah serves on the Board of Directors of the Book Industry Study Group and eBOUND Canada, and is Chair of the ONIX International Steering Committee. Ruth Linka began her career in publishing at Coteau Books, a literary publisher in Saskatchewan. Since then she has worked at Raincoast Books as the Production Manager and Associate Art Director, and at NeWest Press as the General Manager. In 2001 Ruth co-founded Brindle & Glass which was awarded “Emerging Publisher of the Year” at the 2003 Alberta Book Awards. In 2007 Ruth was made Publisher at TouchWood Editions, of which B&G is the literary imprint. In 2014 Ruth moved to Orca Book Publishers, where she is the Associate Publisher. She serves on the Association of Book Publishers of BC board and The Victoria Book Prize Society and has been a board member for the LPG, the Book Publishers of Alberta, and various community theatres and projects. Check out our speakers page for a full list of all the Tech Forum and ebookcraft speakers, panelists, and workshop leaders. We’re going to continue to post guest blogs from many of our speakers, so keep coming back to our Tech Forum and ebookcraft and news page to see what’s new. And, if you don’t already have your ticket, you can, and should, register now. Early-bird pricing ends Jan. 31!